For the past two years, fellows from the Dartmouth-Hitchcock Hematology-Oncology Fellowship Program have been engaged in a global oncology fellowship elective in Rwanda. Steve Bensen, an associate professor of medicine, had long wanted to get involved in global health work. He recently got his chance when he spent two months helping to train physicians and residents at two hospitals in Rwanda. 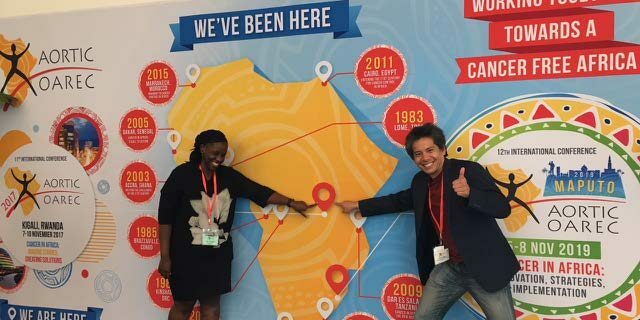 For the past two years, Dr. Jean-Luc Nkurikiyimfura has been collaborating with faculty at the Geisel School of Medicine despite working and living thousands of miles away. Nkurikiyimfura, who heads the HIV clinic at Kigali University Teaching Hospital in Rwanda’s capital, is part of the Rwandan Human Resources for Health (HRH) program. Lars Blackmore reflects on the time his family has spent in Rwanda and the successes of the HRH program. 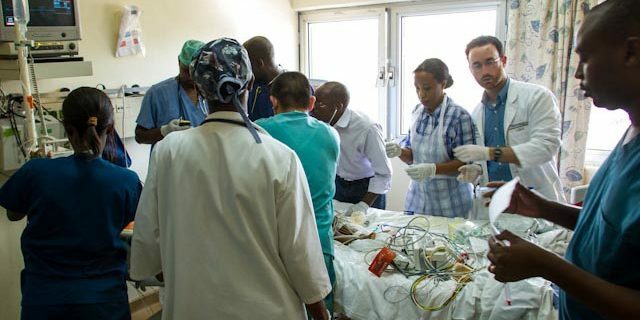 During his six week stay in Rwanda, Dr. Bruce Friedman brought decades of experience as a physician and educator in cardiology to an audience with a very different background from that of his students at Geisel and DHMC. Dr. Nick Perencevich (Dartmouth ’69) was the first American surgeon on the ground in Rwanda when the Human Resources for Health program got underway this past summer. He has been a trailblazer here and reflects on his time there as he prepares to leave. Instituting major changes at King Faisel Hospital in Kigali, Rwanda can be a slow and sometimes frustrating process. But Dartmouth’s Dr. Dorey Glenn, who’s working in the hospital’s pediatric department as a faculty member with the HRH program, is learning how to get things done. This never happens. Pediatric patients don’t get airlifted anywhere in Rwanda, but nevertheless: there’s the Air Force helicopter, idling behind King Faisal Hospital in the heart of Kigali after its trip from Butare Hospital, about 75 miles south of the capital. Together with her first-year resident, Theoneste, and fourth-year medical student, Felix, Geisel School of Medicine Professor Lisa Adams, MD, works up a newly arrived patient on the infectious disease ward at the University Teaching Hospital (CHUK) in Kigali, Rwanda.